The district attorney filed the motion to increase the bonds of two alleged hate crime case suspects after a judge lowered them without consultation. AUSTIN, Texas — After two suspects' bonds were lowered in an alleged hate crime investigation, a Travis County official successfully filed a motion to have their bonds raised to their original amounts, which was approved on Feb. 19. 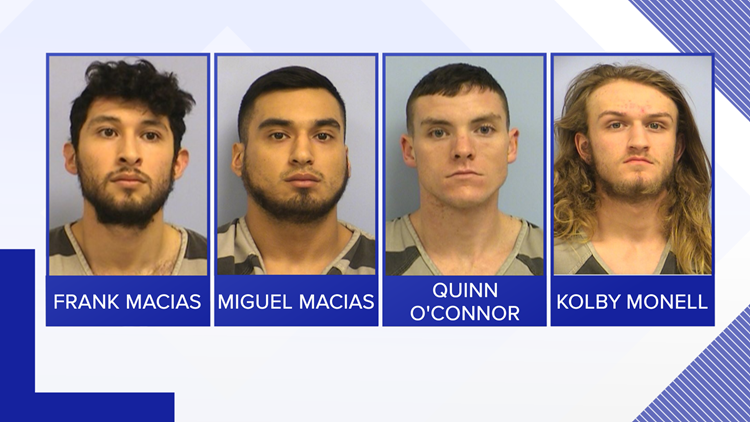 Police charged Frank Macias, Miguel Macias, Quinn O'Connor and Kolby Monell with two counts of aggravated assault charges. Presiding Judge Sherry Statman first recommended their bonds be set at $150,000 for each count, for a total of $300,000. But, at an arraignment on Feb. 12, Judge Stanley Kerr – with no input from the Travis County District Attorney's Office – reduced Frank's total bond to $100,000, according to court documents. Miguel's bond was also reduced to $150,000. The bonds of O'Connor and Monell were not reduced. The District Attorney's Office was made aware of the reduced bonds on Feb. 15, a spokesperson told KVUE. In an email response to Judge Statman, Judge Kerr reportedly told her he wasn't aware this was a high-profile "media" case nor that the DA was involved, a spokesperson said. He simply reviewed the files in front of him at the time of the arraignment and lowered the bond amounts. On Friday afternoon, Travis County DA Margaret Moore filed a motion to increase bond in the state's case against Frank Macias. It was later approved on Tuesday morning for both suspects. "Due to the violent nature of the crime and the hate speech showing a bias against a very specific segment of the community that was used during the commission of the offense, the safety of the victims and the community must be considered in setting an appropriate bond. There has been a large community outcry in reference to this crime, and there is a large segment of the community that feels unsafe after these events. [...] The current bond is insufficient, and justice demands that the bond be increased." Certificate of Service By my signature above, I hereby certify that I have notified the Defendant in this cause of the State's Motion to Increase Bond by filing the foregoing document in the public record of this cause, the State has been unable to verify counsel for the defendant. CAUSE NO. Frank's defense attorney has requested a bond hearing for March 7 at 1:30 p.m., stating he believes the bond is too high. According to online Travis County records on Feb. 19, only O'Connor was no longer listed as an inmate.